As countless films, books, and conspiracy theories have recounted, the presidencies of John F. Kennedy and Abraham Lincoln came to dramatic ends when the men were struck by assassins' bullets. Lesser-known are the deaths of James A. Garfield and William McKinley, who suffered the same fate, though both clung to life for days after. 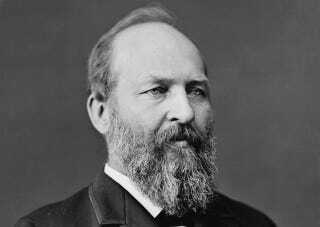 The 20th president, Garfield (pictured above) was shot in the arm and the back on July 2, 1881 in Washington, DC. His assailant was Charles J. Guiteau, a ne'er-do-well lawyer whose mental instability manifested in an obsession with Garfield; allegedly, he yelled "This is the hour of your doom!" as he drew his pistol. The president had only been in office for four months, and he held on until September 19, when he died from "an infection and internal hemorrhage." As the weeks passed, Garfield’s body became engorged with pus. His face began to swell and had to be drained. Initial meals of steak, eggs and brandy were soon replaced by eggs, bouillon, milk, whiskey and opium. He lost nearly 100 pounds as his doctor’s starved him. Doctors inserted drainage tubes and continued to probe for the bullet; at one point, they brought in Alexander Graham Bell, who had invented a metal detector and thought he might be able to locate the slug by passing it over the president’s abdomen. All was for naught. McKinley was the 25th president, and his end came about thanks to anarchist Leon Czolgosz, who shot him twice in the chest outside the "Temple of Music" at the Pan-American Exhibition in Buffalo, New York, on Sept. 6, 1901. Though the president initially seemed to be recovering from his wounds, he succumbed on Sept. 12, unable to overcome the gangrene that had been festering internally. His death inspired the formal assignment of the Secret Service to protect future presidents, starting with his successor, Theodore Roosevelt. Czolgosz was convicted and executed in an electric chair on October 29, 1901. The unrepentant killer’s last words were “I killed the president because he was the enemy of the good people—the working people.” His electrocution was allegedly filmed by Thomas Edison.